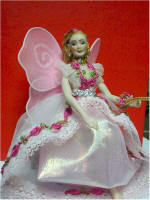 Misty, the sleeping fairy was made by Nancy Faye Roach as a gift for Grace. Grace's husband, Jim, constructed the twig bed while laid up with a bad knee, in the summer of 2003. Grace decorated the bed with flowers and feathers for Misty. 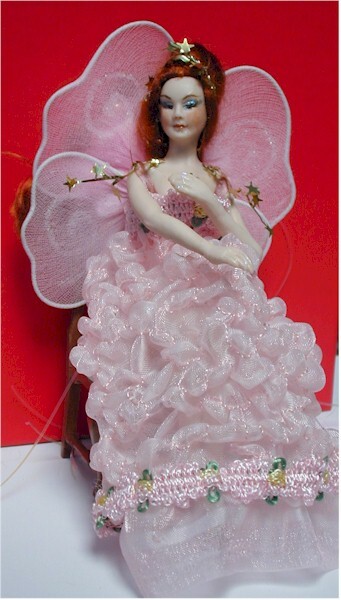 One day, Misty will have her own home in a tree stump house along with other Fairies that Grace has collected. 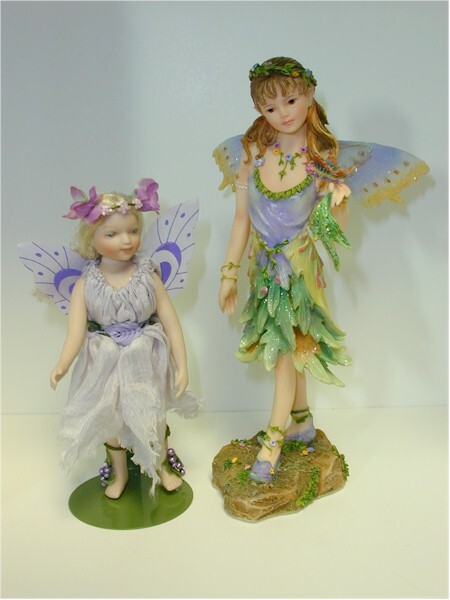 Rose and Jinx, also made by Nancy Faye Roach, are Misty's cousins. They came to visit Misty in 2004. Now they've gone to live with two little girls who are friends of mine.. I created these two fairy scenes to display the fairies that I have. I had this one scene in in my head but I never got the time to build it. When I received another fairy for my birthday, I decided these beautiful little creatures needed to be displayed. This is a redo of this scene. I didn't like the way the other one looked. I took out the tables and put in a tree trunk, lots more fairies, redid the water, & added a leprechaun sitting on his pot of gold.